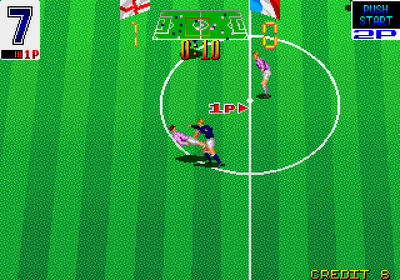 Italia 90 – a great World Cup if you were English (well, up til the end of the Semi Final). 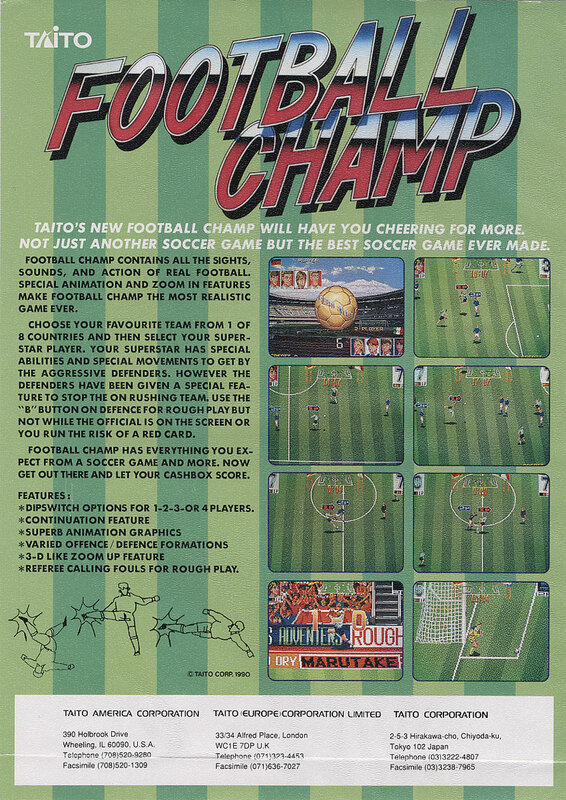 Probably released to cash in on the Greatest Football Tournament on Earth, ‘Football Champ’ was Taito’s quirky and immensely playable Football arcade game. 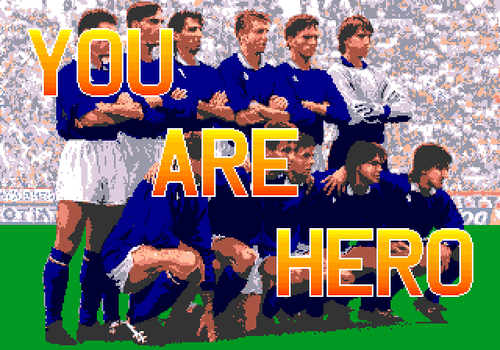 The Greatest Football Arcade Game on Earth. according to me. 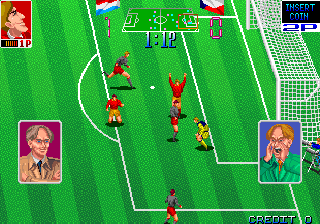 There was a luxury version of this game, with a little bench, and a huge (well, 40 inches or so) screen positioned roughly 2 or 3 metres away from you. If memory serves correct. And it doesn’t always. if you got caught by the referee, you could get a yellow or red. The idea was to floor him from behind first, then go on your merry way, crippling the opponents. It just wasn’t sporting. But it was funny. The action was fast, frenetic, and there were sweet spots on the pitch that, if you timed it right, you could lob the ball over the goalie as he grasps at thin air. Getting the time and space to perform this move was not always possible though, as opponents always seemed to be harrying and hassling, which made the goals,when they did go in, even sweeter. 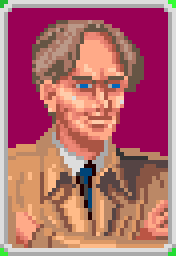 and you can play it on MAME. You should try it. there is a little bit about ‘Super Shots’, something I never heard of before. They even have some footage on youtube of someone doing these hallowed moves, for goodness sake. A game that got me back in the arcade. Back in 1987 I was working at a theme park (Drayton Manor) that had an arcade bang in the centre of the park, and after all the rides shut down, the canny Arcade operator used to keep his establishment open for 30 minutes or more, to mop up any pennies not already spent by punters. And invariably, one or two of the staff would wonder in to either blow their meagre earnings (this was pre-minimum wage and a lot of us were Sixth formers or college / University students who would take whatever pay we could get). Some would go to the shove penny contraptions or the fruit machines, but I only had eyes for the video games. 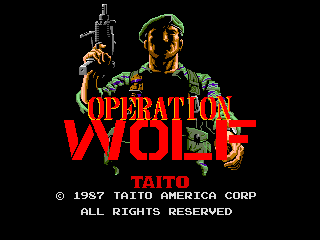 When Operation Wolf arrived in the summer of 1987, I was only interested in standing at that cabinet, cradling the fixed swivel mounted light gun, that looked like an Uzi, and attempting to free the hostages from the 6 stages of concentration camp war madness. 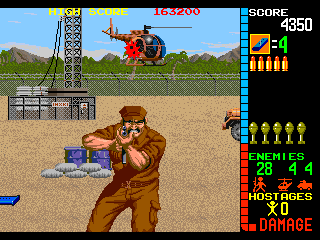 So many great elements in this game; the way the gun gives force feedback to simulate recoil each time you fired the gun, the relentless barrage of enemy hostility, the constant search for ammunition as your depleted stocks begin to become a threat to your mission. The little static cut scenes that move the story on with economy and purpose. The Arnold Schwarzenegger / Dolph Lundgren super-soldiers. The graphics, for their time, were fluid and exciting. The controls on the gun were responsive and the on rails gaming experience immersive. And that cabinet looks marvelous doesn’t it? 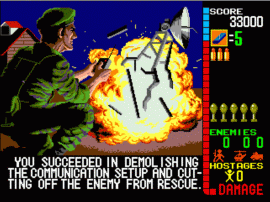 When you eventually completed a level, it was with a real sense of achievement, such was the well pitched difficulty setting. 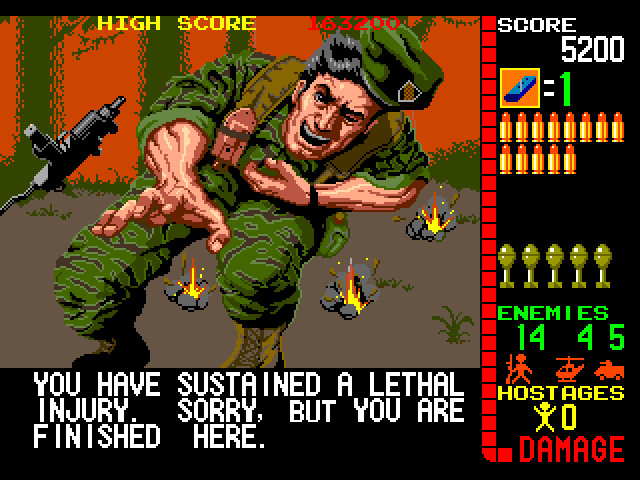 Death was a common experience in the game. 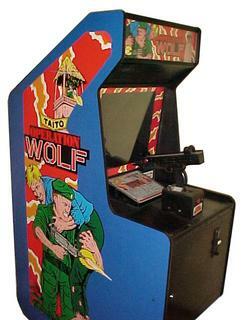 I do not know how much money I put in that machine at Drayton Manor, but for every 10 minutes of Operation Wolf, I probably had to work a couple of hours to afford to play it. But that was okay. 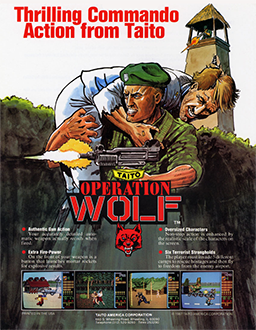 Operation Wolf was a classic arcade game that made the light gun / on-rails game relevant and exciting. Even 25 years later, its a perfectly playable game. You can see for yourself as you can play it online. You just don’t get the light gun experience. Even the home conversions were good (and there were plenty of them, including a good CPC464 version, a C64 version and a top notch Amiga conversion. It also spawned 3 sequels, one of which, Operation Thunderbolt (1988) nearly cost me as much in 50p pieces as its predecessor.